To enter expired products, start by clicking the "Inventory" button on your dashboard bar then on "adjustments." Now, choose the adjustment type of "expired" and enter a description, I just use "expired" again. Choose the correct date that you want the product to be taken out of your inventory and click "save." Choose the reason for this "expired" adjustment. These choices make this function more flexible. You can use it for purely "expired" products or for the other reasons listed in the "adjustment type" drop down. You will also need to choose the number of items you're removing before clicking save. You can add multiple items to this adjustment. Now, choose to either "save draft," meaning you want to leave this open and work on it more later without committing to the changes, or "apply adjustment," which will remove products from your inventory. 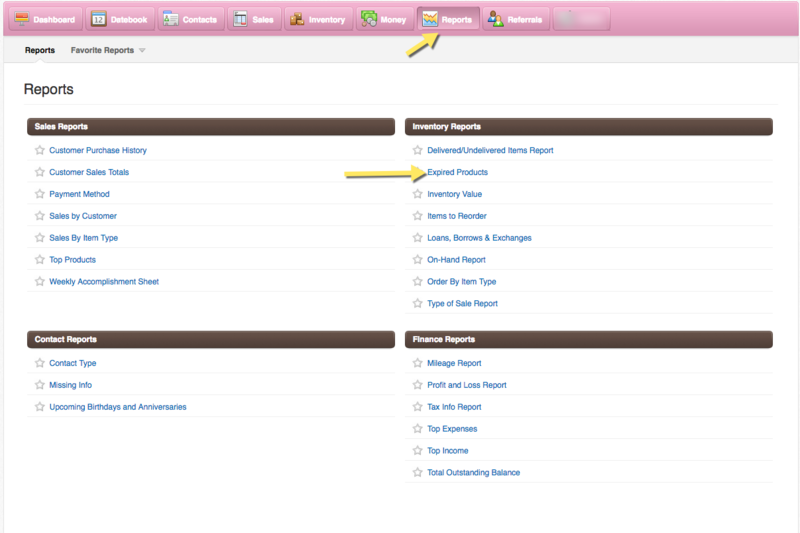 Last, take a look at the reports section by clicking on "reports" on your dashboard bar. Now click on "expired products report" to see a breakdown of products you've removed by marking them "expired." You'll be able to look at "expired" products for a particular date range or see them all at once.